Its so hard to believe but I’ve been writing my blog for a year now – anniversary date: January 3rd, and I never imagined I would have this much to write about. In fact, when I first started I thought I would be struggling for content but it has been quite the opposite! Well, what better way to celebrate than having my name and a picture of my gingerbread snowflakes in the Saturday National Post!!! 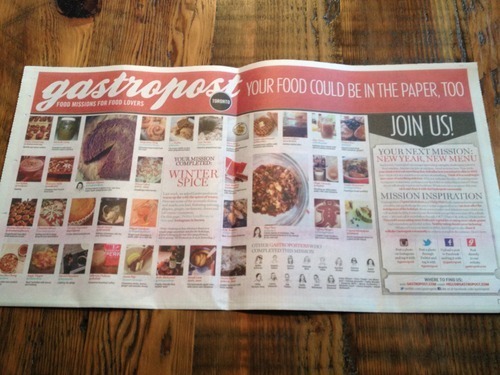 To be honest, I actually don’t subscribe to any newspaper publications but a friend brought me a section called “Gastropost – Food Missions for Food Lovers” and suggested I sign up. So, my first mission and post made it in the January 5th’s National Post!!! What a way to start the new year, check it out! My post is in row 3, second from the left! January 5th Gastropost – courtesy of Gastropost, link is here. PDF version here. that is soooooo amazing!!!! well done!!!! only way is up from here sista!!!! you can create a section about naokoEats in the PRESS!!! What a great beginning of 2013!